In my research for my post earlier this week on how different systems handle skill checks, I found that a number of DMs like to use scaling ability checks. I’m absolutely not a fan as they take away from the players and create a sense of “difficulty for the sake of difficulty”. A scaling ability check is when the DC of simple ability checks is increased as the party levels up and gains more power during the campaign. For example, the DC to scale part of a cliff is 15 when the party is level 3, but that same cliff face is DC 20 when the party is level 8. Nothing has changed besides the party’s level and any of the skills, spells, or equipment they’ve earned along their journey. The cliff face hasn’t gotten more dangerous, or more difficult to climb narratively. What’s the point of this? The justification is generally that because the party is now more capable, ability checks need to get more difficult to “challenge” them. I disagree with this completely. Scaling the DC of ability checks isn’t a fair or fun way to present challenges to the players. It’s difficulty for the sake of difficulty. Scaling ability checks are a classic example of “difficulty for the sake of difficulty”. Simply put, the DC of the ability checks are high simply because they can be, not because they should be. In my opinion, this is bad game design. As a GM, when you call for an ability check, you should be able to easily justify the DC of the check. The DC is the bare minimum required to pass the check. A higher value is just gravy and can result in a better outcome, but anything below that is either a failure or a worse outcome. For example, there’s no additional challenge to rolling a DC 15 History check compared to a DC 10 History check. The player isn’t critically thinking of a new solution and their character isn’t using their powers or abilities. A good challenge makes the players think; they’ll use their spells and abilities optimally or creatively and think of different ways to solve a problem. At its core, this type of game design exists only to “even the playing field” between the party and the game. Your checks exist to exhaust the party’s resources. It’s frustrating and it’s a slog to get through if this is the type of check that needs to be rerolled multiple times. Use this chart from the Dungeon Master’s Guide to gauge the difficulty of your ability checks. Credit to Wizards of the Coast. There’s nothing I hate more in games than tedious mechanics or situations that are present solely to make the game more tedious. In fact, I’ve written an entire post about how I purposely throw in magical items to avoid this problem. That being said, tedious mechanics aren’t the only problem with scaling ability checks. The real issue is that they are tedious and most importantly, unrewarding. Tedium is generally accepted by people if there’s a light at the end of the tunnel. In the case of scaling ability checks, this rarely happens. A higher DC typically only comes with more failures from the party. Tedium is necessary and in some ways is a core facet of RPGs. While you can’t get rid of all the tedious mechanics, we can certainly do our best to make sure that we don’t create new ones without reason. More difficult checks should come with a reward. Difficulty shouldn’t serve to punish the players. The worst offense that scaling ability checks create is that they take away situations to showcase the party’s growth. D&D is an RPG. This means that you get more powerful as your characters level up, acquire magical items, and gain other rewards. These are the rewards for overcoming past obstacles. Ideally, they should make future obstacles easier, or give you more options to tackle the same problem. If the DM continuously increases ability checks to match your power, you’ll never feel powerful. This is important. It’s important to feel powerful so that you can see the progression. It helps you as a player recognize how far you’ve gotten, and how the challenges of the past and tedious problems have made you stronger. Having moments like these are crucial. You want your players to realize how far they’ve gotten since it helps them appreciate the game more. Seeing your progression means that you’re more likely to continue progressing since you want to find out just how strong you can become. Think of this as the “carrot on a stick” of D&D. It’s important to let the party eat the carrot! I have no issue with games being difficult. In fact, I’ve talked about how we should strive to create challenging, but fair encounters before. Ability checks shouldn’t be exempt from this philosophy. My problem with scaling ability checks isn’t that they make ability check DCs higher, it’s that they make them higher for no reason. As characters gain power and become proficient in new skills they are able to take on new challenges and find more creative solutions to problems. Magic and class features can bypass ability checks, but there’s always a cost for doing so. Art by Sandra. Is There a Mechanical Reason for the Difficulty? Small changes to the environment or the characters could make the same check more or less difficult. While we’re talking about making checks more difficult in this post, it’s important to remember that mechanical effects can also benefit the players! Weather effects are one great example of how a mechanical reason could increase the DC of an ability check. If the cliff face is slick from the pouring rain or the ongoing blizzard it’s going to be a more difficult athletics check. This makes sense from a game mechanic perspective and a logical perspective. Small changes like the weather can make ability checks like that example more difficult. It’s a good way to give your players a problem-solving opportunity. Do they take the risk and climb the slick rocks, or do they find a new way to bypass the obstacle? On the flip side, if that same character approaches the cliff face with a brand new grappling hook or climbing gear they may make the check even easier or be able to bypass the obstacle without having to make an ability check. Is There a Narrative Reason for the Difficulty? A regular ability check can be made to be more difficult for narrative reasons as well. The reason could be because of a consequence of the party’s action, or the present circumstances may have an impact on the ability check. Time is by far one of the most prominent narrative reasons for increasing the difficulty of a check. If the party is pressed for time you could make the case that them rushing through an obstacle may make it slightly more difficult. This can also present itself as a risk-reward opportunity. Being more powerful means that characters can take bigger risks and tackle more challenging problems. For example, the cliff face is still a DC 15 Athletics check, but if they take a more challenging route that requires a DC 25 Athletics check they can reach the top of the cliff in half the time! It’s a riskier option to take the more dangerous route, but if they are pressed for time the party can save a lot of it by taking that risk. This is what an interesting challenge looks like. There’s a risk involved, but there’s a reward and there’s a reason for the difficulty. 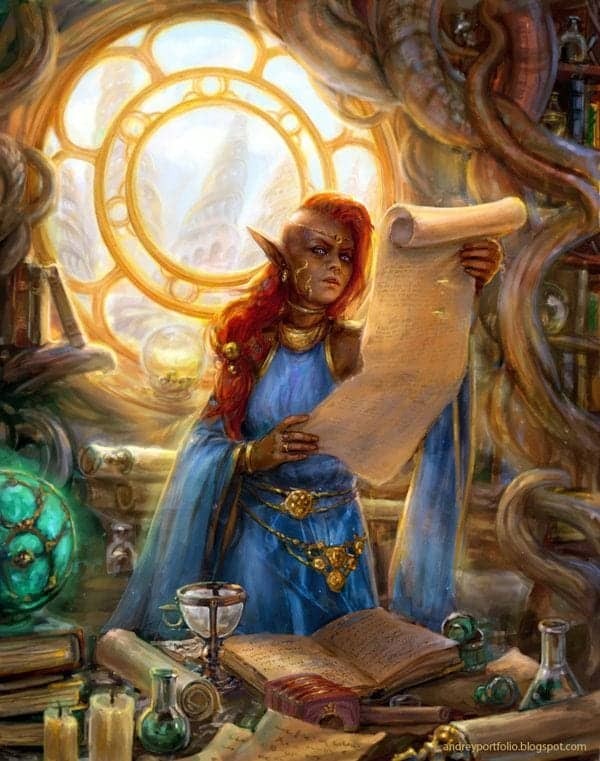 Knowledge is power, and there are a handful of different knowledge skills in 5e! Art by Andrey Vasilchenko. Challenging obstacles and encounters are a good thing. However, difficulty for the sake of difficulty is absolutely not. 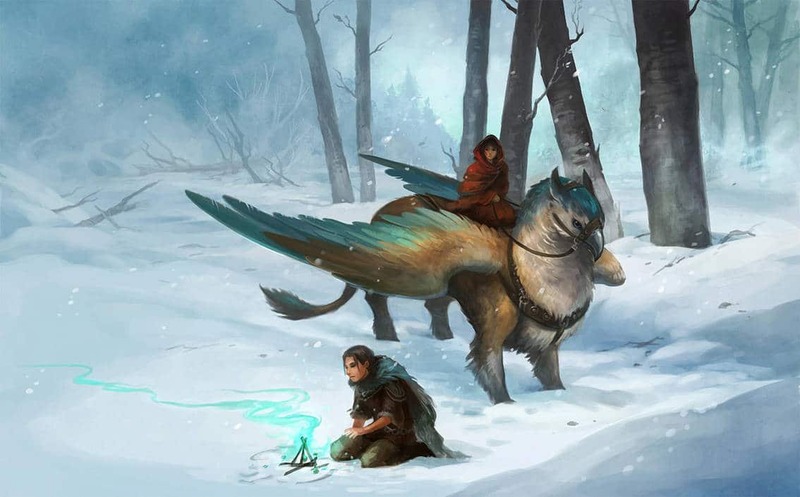 Scaling ability checks are one of the laziest ways of creating difficulty in D&D 5e. If there is no reason an ability check to be a higher difficulty other than “to challenge the players” you need to either a) not artificially raise the difficulty or b) find a fair and logical reason for the ability check to be more difficult than it typically would be. It isn’t fun when something is difficult to the point of being tedious or unnecessary. This type of game design makes the game feel more like a DM vs. the Party game which, in my opinion, is a recipe for disaster. Instead, find ways to present your players with reasonable challenges and ways for them to raise the difficulty for a reward. High-risk, high-reward situations are fun and a way healthier way to create challenge and difficulty.